Clothing for the Ancient Aztecs offered a unique take on fashion with their colourful style sense. Clothing was an expression of many things for the Aztecs, their way of living, social class, gender, their role in society, age and even religion were reflected in their clothing. We can learn a lot about their clothing right now with insight into the jewellery and the ornaments they adorned themselves with. The meaning of their Masks, and how they styled their hair. How men’s, women’s and children’s fashion differed, and even what clothing the ancient Aztec people would wear in battle. Aztec clothes were made from different materials. The most commonly used were cotton fibre and ayate fibre, which was made from the local Maguey Cactus. But it was told that cotton was actually a fabric the Aztecs reserved for the nobility or the upper class. It has been told that for a commoner to wear cotton could even signal a death sentence for them. Due to the need for lots of fabric Aztec women started weaving at a young age and they would use a lot of colour for dying the fabrics, giving the bright coloured clothing that many hold synonymous with the Aztec clothing style. The Aztecs projected wealth by wearing extensive jewellery often made of gold or precious stones. Headdresses often made of feathers were also considered to be very beautiful. Feathers, gold, fur, necklaces, bangles, earrings, nose rings and even lip rings were worn. They become much more elaborate in some costumes. These may be made of bone, wood, shells and stones. Animal teeth, claws and feathers were used as well. The most expensive feather worn by royalty that was rumoured to be more precious than gold at that time was called Quetzal, and it comes from a bird with brilliant blue and green feather. While the Aztec masks are works or art in themselves and very memorable, the Aztec masks were not an everyday piece of fashion in this society. Masks were worn typically along with costumes when the Aztecs were doing rituals. Each mask that they wore would represented one of the many Aztec Gods, like one of the many fertility or Aztec maize gods. Aztec women often styled their hair in a fashion called the Neaxtlahualli. This was done by braiding the hair on each side of the head that were shaped like horns. Some Aztec women would tie their long hair with scarves or adorn them with colourful headdresses. Men may also wear headdresses and symbols of their tribe or group are on it. The clothing worn by the Aztec Male was simple and designed for their climate and environment. Their underwear at the time were loincloths called Maxtl and if the man was from a high social class, this may have additional fringes and embroidery to add flair and to denote their status. The Aztec men would often also wear Tilmahtle or Tilma which is a triangular cape. The Tilma was used as a cloak or for carrying things and was worn over the top of the Maxtl. The design of the Tilma as in many things in Aztec society portrays the wearers social status and the more intricate and colourful it is signifies that the wearer is of high stature like a noble or a religious leader. For footwear, the Aztecs often wore sandals and these were called cactli. Aztec women like men would dress suitably for the warm and muggy climate they lived in, and like with anything in Aztec society the detail and intricacies of their clothing would often denote their status in society. 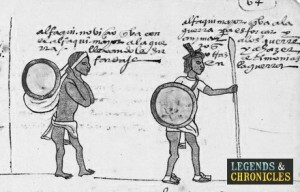 Most Aztec women wore skirts which was called a Cueitl and were secured by sashes called Cihua Necuitlalpiloni. They wore Huipilli on top of them, with was essentially a sleeveless top that was pulled over the head, and would be adorned with various patterns and designs. Typically Aztec children below 3 years old did not wear any clothes, the warm climate of the Aztecs home in the gulf of Mexico meant clothing was really an option rather than a necessity. Children’s clothing would typically be simple and white, and as the girls grew older their skirts become longer while the boys started wearing capes. Aztec warriors wore costumes that showed hierarchy, bravery or something that symbolized their group and fighting tribe. The war heroes got the most lavish clothing as they gain merits earned at war, and it offered new troops something to aspire too. There are animal costumes as well which they believed gave them strength based on their belief of mystical creatures such as the Jaguar and Eagle, and these costumes were given to the most elite Aztec warriors. The elaborate design of these Jaguar and Eagle warrior costumes comprised of shell, gold and feathers. Rich in history and culture, bright colours and lots of ornaments represent the Aztec style whose influence is still apparent in the Mexico. The style of the Aztec people is still in no dispute, from their religious clothing to the intricate and intimidating war clothing, the Aztecs really had a unique style, that was defining in the Mesoamerica time line.